Nabeel Rajab, the Bahraini human rights activist and Index on Censorship award winner, will spend his 52nd birthday in detention. Rajab is due in court on 5 September accused of spreading “false or malicious news” about the government (evidence for which includes a retweet of an Index tweet), “offending a foreign country” by criticising Saudi Arabia’s incursions in Yemen and “offending a statutory body” by condemning conditions in the country’s notorious Jau prison. He faces 15 years behind bars. This is just the latest in a long line of actions taken by the Bahraini government against Rajab, one of the Middle East’s most prominent human rights defenders. He has been subjected to ongoing judicial harassment, travel bans, physical intimidation and imprisonment – including time spent in solitary confinement – for his non-violent advocacy of democracy and an end to endemic corruption. 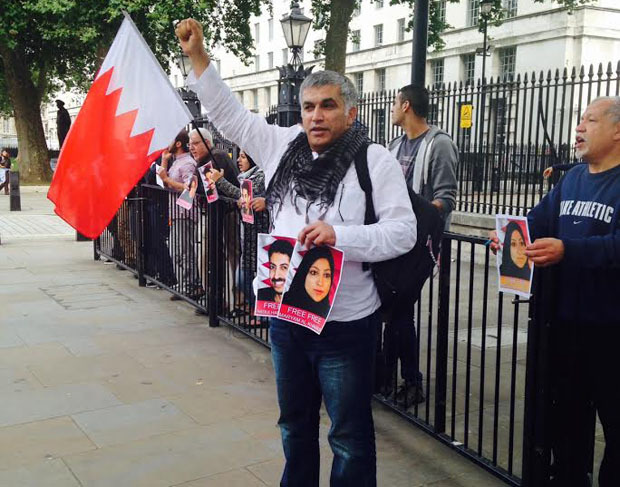 Join Index on Censorship, English Pen, The Bahrain Institute for Rights and Democracy and others at the Bahrain Embassy in London on 1 September to mark Rajab’s birthday and call for his immediate release.